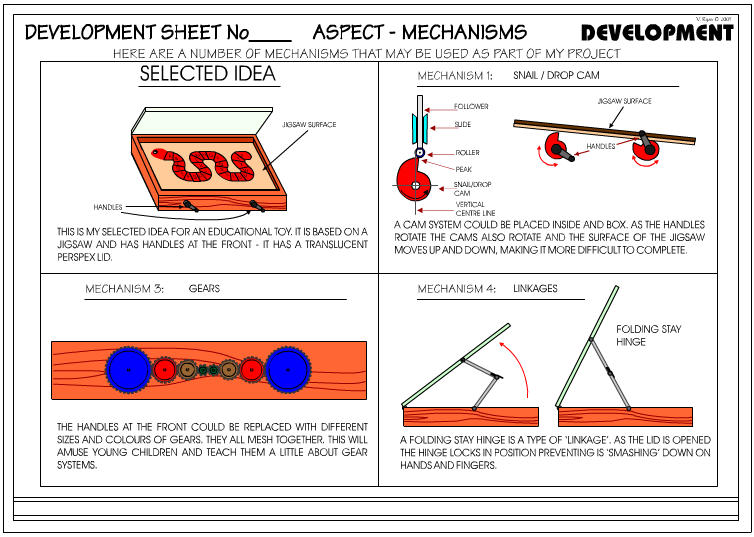 When developing your design you may need to show how mechanisms could be applied to your project. An example is shown below - the design sheet has been divided into four sections. One way of attempting this sheet is to start with a quick drawing of your best design idea. Then draw three types of mechanisms that could be used to improve the way your idea operates. The example below shows how cams, gears and linkages could applied to a basic educational toy design. THIS IS MY SELECTED IDEA FOR AN EDUCATIONAL TOY. IT IS BASED ON A JIGSAW AND HAS HANDLES AT THE FRONT - IT HAS A TRANSLUCENT PERSPEX LID. A CAM SYSTEM COULD BE PLACED INSIDE AND BOX. AS THE HANDLES ROTATE THE CAMS ALSO ROTATE AND THE SURFACE OF THE JIGSAW MOVES UP AND DOWN, MAKING IT MORE DIFFICULT TO COMPLETE. THE HANDLES AT THE FRONT COULD BE REPLACED WITH DIFFERENT SIZES AND COLOURS OF GEARS. THEY ALL MESH TOGETHER. THIS WILL AMUSE YOUNG CHILDREN AND TEACH THEM A LITTLE ABOUT GEAR SYSTEMS. A FOLDING STAY HINGE IS A TYPE OF ‘LINKAGE’. AS THE LID IS OPENED THE HINGE LOCKS IN POSITION PREVENTING IS ‘SMASHING’ DOWN ON HANDS AND FINGERS.